Could the next Canadian Olympic men's hockey team have some star power after all? 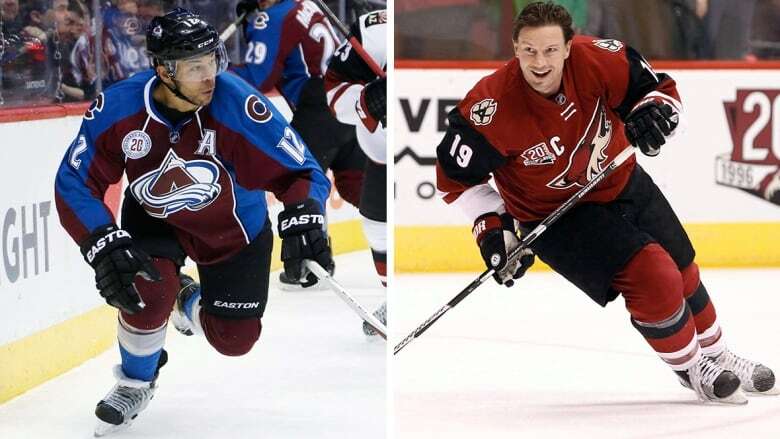 Hockey Canada general manager Sean Burke said Tuesday that he's inquired about the plans and potential availability of long-time NHLers and current free agents Shane Doan and Jarome Iginla. Could the next Canadian Olympic men's hockey team have some star power after all? Team general manager Sean Burke said Tuesday that he's inquired about the plans and potential availability of long-time NHLers and current free agents Shane Doan and Jarome Iginla. Burke, who's building the first Canadian Olympic roster without NHL players since 1994, suggested that both former Olympians would have to be playing somewhere if they were to be considered. He reached out to their representatives on Tuesday morning. "We want to look at all possibilities, but there has to be a long-term plan because it's going to very intense [at the Olympics] and it's going to be great hockey and guys are going to have to have a plan for the year," Burke said on a conference call, which also included the team's head coach Willie Desjardins. Whether or not the two veterans would be interested is another question. "We really are not dealing with this issue as of now," Don Meehan, Iginla's agent, said in an email to The Canadian Press. Canada just completed two tournaments in Russia with 45 players vying for spots on the Olympic squad in Pyeongchang. That group included former NHLers like Derek Roy, Mason Raymond, Max Talbot and Gilbert Brule. Goaltending was split between former Edmonton Oiler and Toronto Maple Leaf Ben Scrivens, Justin Peters, who played three games for the Arizona Coyotes last year, and Kevin Poulin, who's totalled 50 games with the New York Islanders. Doan recently completed his 21st season with the Coyotes, who announced earlier this off-season that their long-time captain would not be re-signed. The soon-to-be 41-year-old represented Canada at the 2006 Olympics in Italy. Iginla, who had 14 goals and 27 points playing for the Avalanche and Kings last season, has played for three Canadian Olympic teams, including gold medal-winning groups in 2002 and 2010. Their involvement in the 2018 Games would preclude a return to the NHL for the coming season. The league decided against allowing its players to participate following five consecutive appearances, beginning in 1998. "We just played games in August and the pace of these games and the intensity was very good and that's going to increase as we move along so anybody that's going to play on this team, no matter what their pedigree or what they've done in the past, we're going to consider," Burke said. The Canadian GM, who played for Canada at the 1988 and 1992 Olympics, said he hoped to have the bones of a roster put into place by November when Canada takes part in the Karjala Cup in Finland.